At this point, I should say that the anxious reactions above are mostly mine, and I'm not the person who has to make the cake, or in this case, be in front of a camera LIVE with many thousands of viewers watching your every move! That responsibility falls on Rick, the cake designer. I'm the detail-oriented one, the multi-tasker who manages day to day operations, client and media communications, and makes sure we're both where we need to be at the time we're needed to be there. I'm the project coordinator of the event, and make no mistake, these are definitely events! I've been a partner (and wife) of Rick in our cake business for more than 10 years, and I am continually in awe of Rick's ability to take these project requests in stride. Rick's approach is very different. Like me, he feels honored by the request to create for someone and gets excited during the design conceptualization phase of the project. What is different about the way he processes these requests is he is able to maintain his focus on the current project at hand - whatever cakes he is making that week - and as time permits, he returns to a project and works on it. The most important cake to Rick is usually the one he happens to be working on at any given moment. He puts his full focus into that cake. Whether it is a cake for our client, a celebrity, or a media project, it will get his full undivided attention while he is working on it. The part that always amazes me is that his timeline for starting and working on a project is drastically different than mine, but he always manages to produce something beautiful and meets his deadlines everytime. 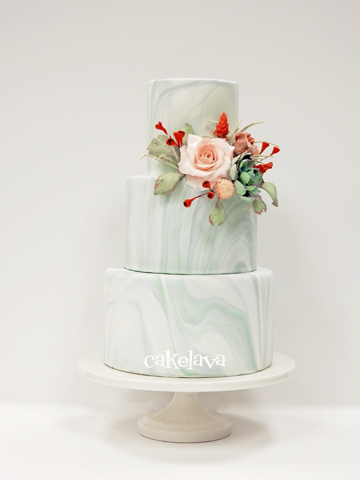 I was completely smitten by the marbled fondant wedding cake Rick made for Style Me Pretty's Facebook live shoot. We knew shortly after we got the project that he would do a marbled fondant cake, but the color palette and desert theme weren't decided until much closer to their arrival. The cake was originally going to be a blush pink marble, and at some point that felt like just days before, I found a beautiful color palette that I approached Rick with, and he loved it! We would go with sage green, grey, and hints of blush pink. With our relatively new status as Nevada residents, we were both taken by the desert themed weddings and also the boho (bohemian) style, which has a wildness about it, and wanted to combine those elements on the cake. I hoped to do a run through so I knew what the cake would look like, but Rick had other cakes to make that week and the extra time was a factor. He felt confident in his ability to produce the cake without a formal run through and would be prepared for their arrival. He colored his fondant to save some time, did a test on a small fondant piece to see what the color would look like, then started making his handcrafted flowers. We decided to do the cake out of styrofoam rather than real cake so he wasn't using a client's cake to demonstrate, and also so we could keep the cake for display in our shop. Originally we thought about having him paint the flowers on camera but opted not to do that to save on time.